In this lesson, we will learn how to find the average rates of change and secant lines, which are the equivalent geometric definition of the average rates of change. The average rate of change of a function 𝑓 between 𝑥 and 𝑥 + ℎ is 𝑓 ( 𝑥 + ℎ ) − 𝑓 ( 𝑥 ) ℎ . Compute this quantity for 𝑓 ( 𝑥 ) = − 4 𝑥 − 8 2 at 𝑥 = − 4 , and for ℎ = 0 . 3 . Let 𝑓 ( 𝑥 ) = − 3 𝑥 + 7 𝑥 − 2 2 . Compute the average rate of change function of 𝑓 as 𝑥 varies from 5 to 5.1. 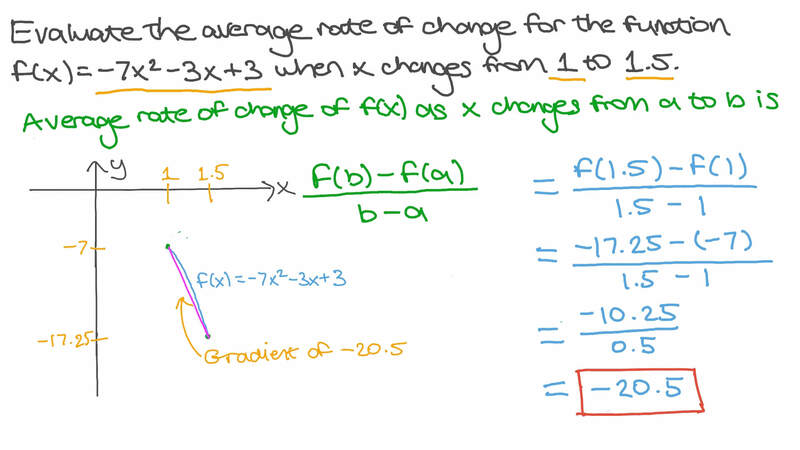 Evaluate the average rate of change for the function 𝑓 ( 𝑥 ) = − 7 𝑥 − 3 𝑥 + 3 2 when 𝑥 changes from 1 to 1.5. Evaluate the average rate of change of 𝑓 ( 𝑥 ) = √ 2 𝑥 − 1 when 𝑥 varies from 5 to 5.62. For the function , list the average rates of change of over the interval , where , evaluated to 4 decimal places at most. A farm’s production in kilograms 𝑦 as a function of the kilograms of insecticide 𝑥 is given by 𝑦 = 1 4 6 − 4 7 3 𝑥 + 8 . Find the average rate of change in 𝑦 when 𝑥 varies from 13 to 17. A triangular lamina with a base twice its height expands while maintaining its shape. Find the average rate of change in its area when its height changes from 14 cm to 23 cm. Determine the average rate of change for 𝑓 ( 𝑥 ) = 6 𝑥 − 8 2 when 𝑥 changes from 8 to 8.4. Determine the average rate of change function for at . Determine the average rate of change function 𝐴 ( ℎ ) for 𝑓 ( 𝑥 ) = 4 𝑥 + 3 𝑥 + 2 2 at 𝑥 = 1 . Find the average rate of change function 𝐴 ( ℎ ) of 𝑓 ( 𝑥 ) = 2 𝑥 + 3 0  when 𝑥 = 𝑥  . Determine the average rate of change function 𝐴 ( ℎ ) for 𝑓 ( 𝑥 ) = 5 𝑥 + 2 5 𝑥 when 𝑥 changes from 𝑥 1 to 𝑥 + ℎ 1 . Determine the average rate of change function 𝐴 ( ℎ ) for 𝑓 ( 𝑥 ) = √ 3 𝑥 + 1 when 𝑥 changes from 𝑥 1 to 𝑥 + ℎ 1 . Evaluate the average rate of change of 𝑓 ( 𝑥 ) = √ 2 𝑥 + 9 when 𝑥 varies from 𝑥 1 to 𝑥 + ℎ 1 . 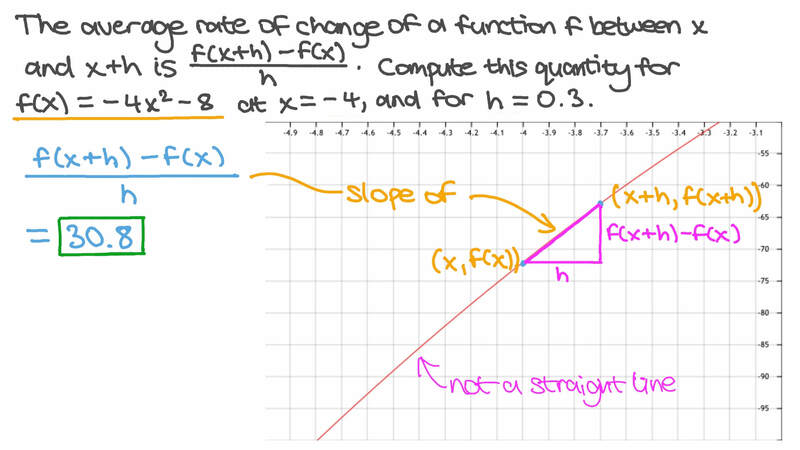 If the average rate of change of the function 𝑓 is 6.67 when 𝑥 varies from 2 to 2.3, find the change in 𝑓 . The average rate of change of 𝑓 as 𝑥 varies from 2 to 2.6 is − 1 . 6 7 . If 𝑓 ( 2 ) = − 1 3 , what is 𝑓 ( 2 . 6 ) ? The graph below is of the sales revenue 𝑓 ( 𝑡 ) in millions of pounds after 𝑡 months. Find the average rate of change in revenue per month between the 9 t h and 1 2 t h months. From the graph of 𝑦 = 𝑓 ( 𝑥 ) shown, on what interval is the average rate of change of 𝑓 the greatest? From the graph of 𝑦 = 𝑓 ( 𝑥 ) , determine the intervals where the average rate of change of 𝑓 is constant. Consider the function . What is the average rate of change in over the interval ? The distance travelled by a body in 𝑡 seconds is 𝑆 = 5 𝑡 + 3 𝑡 + 7 2 . What is the average rate of change of 𝑆 when 𝑡 changes from 9 to 13 seconds? A soap bubble maintains its spherical shape as it expands. Determine the average rate of change in its surface area when its radius changes from 10 cm to 12 cm. The height, in feet, of a projectile as a function of time, in seconds, is given by 𝑠 ( 𝑡 ) = − 1 6 𝑡 + 9 2 𝑡 2 . Find the average rate of change of height with respect to time between 1 and 1.5 seconds. A metallic cube expands but preserves its shape as it is heated. What is the average rate of change of its surface area when its sides change from 69 cm to 69.7 cm? A spherical balloon preserves that shape as it expands. Determine the average rate of change of its surface area when its radius changes from 49 cm to 119 cm.